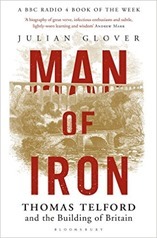 This review is on Man of Iron: Thomas Telford and the Building of Britain by Julian Glover. Telford fits in with my interest in the Industrial Revolution, which are longstanding – in my very early teens my first stay at a hotel was in Ironbridge for a weekend of visiting the museums in that area. More recently I moved to Chester which is not that far from the famous Pontscysyllte Aqueduct and the Menai bridge and London to Holyhead roads, all works Telford was involved in. Telford was born in Eskdale in the Scottish Borders in 1757, a tightknit rural community from which a number of great names have emerged – William Pulteney (formerly William Johnstone) key amongst them, as an early patron of Telford. His father, a shepherd, died shortly after he was born. He originally apprenticed as a stonemason in Eskdale before travelling to Edinburgh and London, where he worked on the refurbishment of Somerset House. 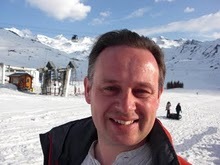 He next worked in Portsmouth where he started to be involved in architectural design. He moved to Shropshire to become (eventually) county surveyor in 1786, where he was engaged in a wide range of projects. As we head into the 1790’s the projects he is involved in expand enormously. Starting with the Ellesmere Canal, which includes the Pontscysyllte Aqueduct. Originally it was intended as a lower level, stone structure with locks taking the canal into the valley, at one point it was proposed that it should carry a rail-way. However, when the moment came the economy and lightness of iron led to the high level structure we see today. Telford then went on to an enormous construction project in Scotland including harbours, the Calendonian Canal, numerous bridges and roads which necessitated extensive biannual visits over a period of 20 years or so. This project was put in place by the government, keen to see development in the Highlands, and later in the period having more cash to fund such work having finished fighting the French. In common with William Smith, who made the first geological map of Britain, and Erasmus Darwin he was tremendously mobile forever travelling at a time when travel was hard. (Both of these men were his contemporaries). Telford knew the Darwin family and admired Erasmus Darwin’s “The Loves of Plants”, an epic scientific poem (a genre that has long fallen into disuse). In his earlier years Telford turned his hand to (not particularly good) poetry in the manner of Robert Burns who again was also a contemporary and was born not far from Eskdale. In addition to this he directed the construction of the London to Holyhead road including the Menai Bridge, and with spurs along the North Wales coast to Conwy. He also planned the Göta Canal which crosses Sweden from the North to the Baltic Seas. The book includes a lengthy appendix listing his works (and the resident engineers on those projects, where relevant), I did consider mapping all these works but decided the list was too long! Much of his inner motivation we learn from his correspondence with Andrew Little, a boyhood friend which sadly ends in 1803 with the death at age 48 of Little. Telford never married and there is scarcely a hint of any relationships with any women, Glover suggests in passing that his relationship with Little may have been very deep. In his correspondence with Little we see Telford’s voracious appetite for continuous learning, but also a degree of cunning in his ambitions. He is not just a skilled technician in his fields but also a skilled worker of contacts, and project manager. He had a keen eye for his progress. There’s some discussion in the book as to how much we should consider the projects he was involved in as his individual successes or as part of a team. This seems to me to be something of a trap, we tend to seek out the hero, the individual in any venture rather than truly appreciate the team effort. Think for example the way in which individual footballers are adulated. This carries over into histories of science and engineering, much of popular history of science is about the “great man” rather than the broader sweep or the group effort. Telford was no doubt technically able across a wide range of topics, he knew how to work his patrons, and he seems an excellent project manager. It’s clear there were often others like William Jessop who were notionally his superior for projects such as the Ellesmere Port canal and some of the Scottish work and likewise he had strong independent subordinates, particularly in Scotland, who delivered the work. Often biographers seems to fall into the trap of considering their subject “not sufficiently recognised”. Telford died in 1834, a somewhat diminished figure. By that time the railways were starting to spread across the country and they would soon displace the canals and roads that had been his life’s work. I can’t help thinking that the projects that he worked on such as the Menai Bridge, the London – Holyhead road and the Ellesmere Canal demonstrated that the railway lines which were to come were feasible, if not always economically viable. Many times whilst reading this book I googled for the bridges he had built and found them still standing, sometimes still in use, sometimes by-passed by newer versions built to carry traffic unimaginable 200 years ago. Nevertheless they represent an impressive legacy.